16" X .125" DRY WALK BEHIND DIAMOND BLADE FOR CURED CONCRETE Diameter: 16" Thickness: .125" Segment Height .275" Arbor: 1" with pin hole Use: Cuts cured concrete. Available in .275" segment height only. Blade thickness .125"Note: May be used either wet or dry. Segments are lazer welded on both sides. 16" X .125" with 1" Arbor and pin hole. 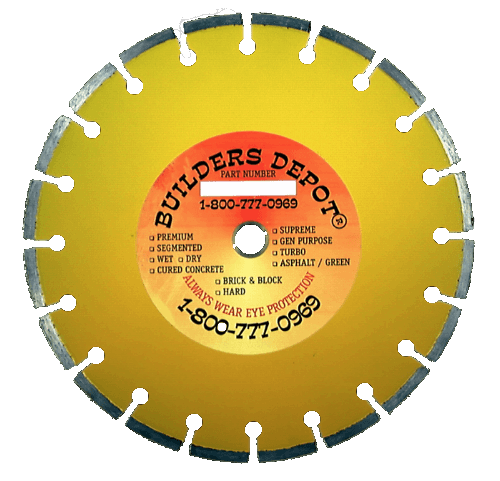 Builders Depot® Supreme Grade Laser Welded Dry Cured Concrete Blade for low HP Saws are designed for the professional cutter. They offer the longest blade life with the fastest cutting speed when cutting cured concrete and masonry without the use of water. ♦Highest quality laser welded blades for cured concrete ♦Recommended for 5 to 20 HP saws, and hand held saws They are laser welded so they can be used dry. Remember, water always helps to keep blades cool and can only improve the life of a dry blade.